A few weeks ago while shopping at my Kroger I saw these adorable erasers- sushi style- in the clearance section. At 69 cents they were a steal. I couldn't pass them up! My husband said "What are you going to do with them?". What am I going to do with them? 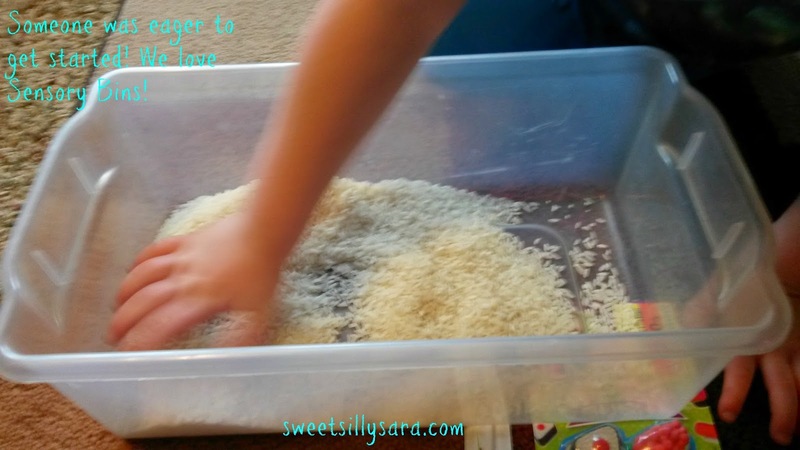 Make a sensory bin of course! 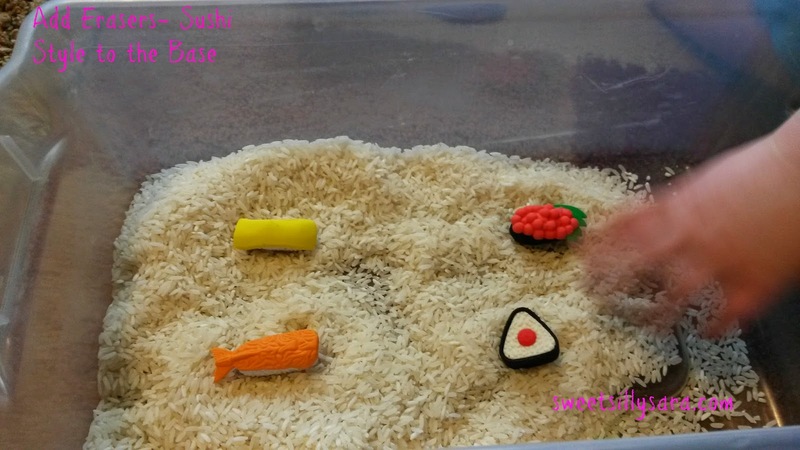 A Sushi themed sensory bin sounded like fun to me! 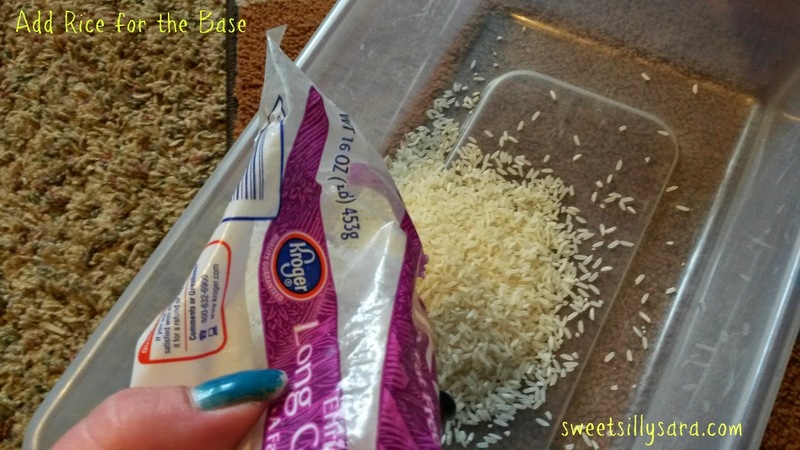 I picked up a bag of long grain white rice, one pound was on sale for $1.09. I used this as my base. My son was intrigued. He couldn't wait to get his hands in the bin of rice! Next we added our Sushi Erasers. Again, Eager Hands were grasping to get involved. Not that I can blame him! Finally, we finished the bin off with a pair of chopsticks. 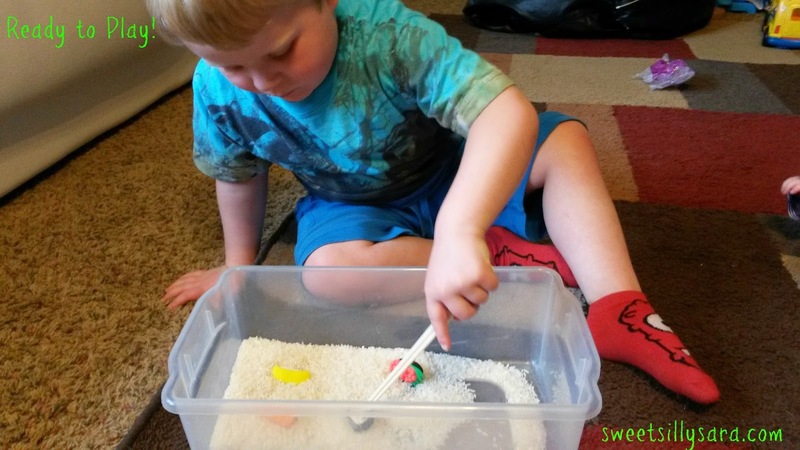 And there you have our under $2 sensory bin! It was easy to make and fun for Roo to play with. I liked that we could enjoy the feeling of rice when we touched the bin, the rice was fun for roo to dig around in. He likes the way it sounds when he picks up a handful and drops it in the bin. The chopsticks are great for his fine motor skill development. When he grew tired of picking up the erasers with the chopsticks he fed rice to an assortment of dinosaurs. Then he decided to toss handfuls of rice into his barnyard toy for the other animals to eat... and yes, it got messy. But, I went with it! After all this was my big idea of fun and dried rice is pretty easy to sweep up. Do you engage in sensory play with your kids? I would love to hear about your favorite sensory bins. 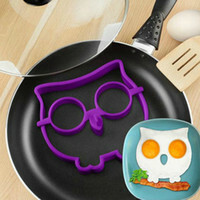 I have seen those little erasers around, great use for them!Thanks for linking up to the Thoughtful Spot!